A complete 4K camera and 3-axis gimbal system come integrated with the Phantom 3 Professional edition quadcopter from DJI. In addition to video, the camera is capable shooting up to 12MP still photos using JPEG or non-proprietary DNG RAW format. The three axes of the gimbal give you pan and tilt control, and keep the horizon line level even as the aircraft banks. Different gimbal settings allow the camera to lock onto a fixed subject, be moved manually using transmitter rotaries or the app, or to simply provide camera stabilization. 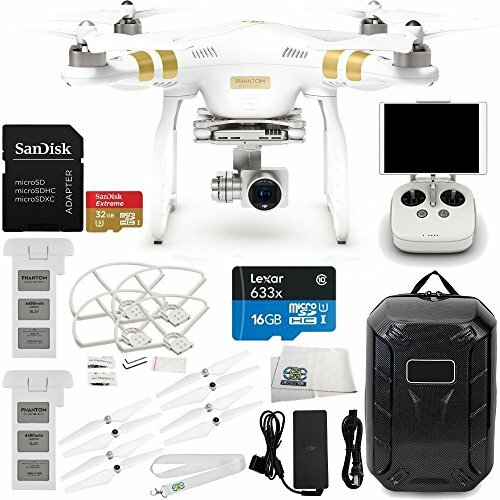 This bundle is “ready-to-fly,” meaning the basics to get you in the air are included – a flight battery, charger, and pre-bound handheld transmitter (radio controller), and 16GB microSD card among them. Depending on you application, you may also require additional memory cards, additional flight batteries, and a mobile device to access the app, and possibly other accessories. Also note that a number of important compass and GPS calibration steps must be taken before flying to ensure the flight control computer operates correctly.